Chief Thomas J. Boyd began his career as a lifeguard for the Seaside Heights Beach Patrol in 1977, and he was honored three times for lifesaving. 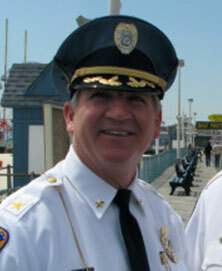 In 1984, he joined the Seaside Heights Police Department as a Patrolman. He attended the New Jersey State Police Academy and graduated as a member of the 182nd Municipal Class. From 1984 to 1991, Chief Boyd served as a patrol officer in the Uniformed Patrol Division. Through his diligence and hard work he was elevated to the rank of Sergeant in 1991 and placed in charge of a squad of patrol officers. In 1997, he was promoted to Lieutenant and assigned as the watch commander in the Patrol Division. In 2002 he was promoted to Captain and placed in charge of the Patrol Division. On December 3, 2003, Chief Boyd was promoted to his current position as Chief of Police. Since Chief Boyd has taken over as Chief of Police, the department has become more proactive, resulting in 2,200 arrests and 1.4 million dollars in fines, breaking twenty-four year records in his first year in office. Chief Boyd and members of the Seaside Heights Police Department were recognized for their heroic and humanitarian actions during and after the devastating Superstorm Sandy in October 2012. They were awarded the New Jersey State Patrolman’s Benevolent Association (NJSPBA) Valor Medal. During the early stages of the epic boardwalk fire on September 12, 2013 Chief Boyd had the foresight to summon mutual aid from fire departments throughout Ocean County. He also spearheaded the breaching of the boardwalk to stem the forward progress of the conflagration preventing destruction of the entire structure. Chief Boyd is an active member of the Ocean County Police Chief’s Association, the New Jersey State Association of Chiefs of Police, the International Association of Chiefs of Police, and the New Jersey State Honor Legion.